The handcrafted ornaments will adorn one of 56 trees representing each U.S. state, territory and the District of Columbia from December 1, 2017 through January 1, 2018 as part of the America Celebrates display. 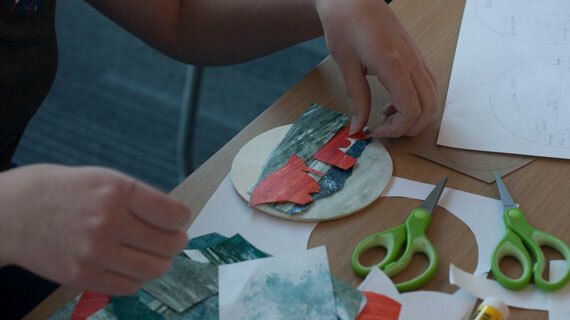 The students, who attend multiple area schools, met in the classroom of the Southern Utah Museum of Art (SUMA) to create the ornaments under the direction of Alisa Petersen. They worked together to paint sheets of Tyvek with a variety of colors and textures found in nature. Then they individually designed and assembled the small landscapes by cutting and layering the painted Tyvek. Presented by the National Park Service and National Park Foundation, the National Christmas Tree Lighting is one of America’s oldest holiday traditions. The first lighting took place 95 years ago on Christmas Eve in 1923, when President Calvin Coolidge lit a Christmas tree in front of 3,000 spectators on the Ellipse. Since 1923, each succeeding president has carried on the tradition.